Undercuts and abfractions pose a significant challenge to dentists who are overly concerned with conservative dentistry. 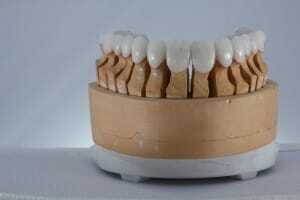 Being too desperate to save tooth structure can work against you when it comes to taking impressions. In this case, an unnecessary remake from the lab can be an unintended consequence. Many dentists feel that they must preserve tooth structure at the expense of other factors. This can occur especially in the case of small toothbrush abrasions (otherwise known as abfractions). Some assume that if they take the natural abfraction, then the lab will be able to create a result that better captures the patient’s tooth structure. Unfortunately, what you learn after many mistakes sending impressions to the lab is that it can be just as problematic to be too conservative as too aggressive. The same thing happens with undercuts. Preserving the shape of the tooth prevents the lab from being able to create an intimate fit in the crown or veneer, which can lead to bacterial contaminants. Here’s the lab perspective: If you think of a concave finish line, there is no way to get around a bend and fill it with ceramic when there is a divet. There is no retention. The lab cannot get porcelain underneath the original tooth structure because the physical reality is incompatible with expectations. Remedying this is all about becoming accustomed to analyzing your preparation design and anticipating what the lab will face. To really “think like a lab,” check out the first five impression challenges in our troubleshooting series. How to avoid inaccurate margins due to preparation design. How the disposable triple tray contributes to unnecessary remakes. How to deal with cowboy preps that do not translate precisely in the lab. How to accurately capture the topography of an impression. How to restart the impression process when discontinuity occurs.